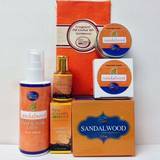 “Thank you for the Gold incense and applying the discount to me, I so appreciate it. I love the spray; it’s the first time trying it and I will be getting more... Nag Champa is the most beautiful awakening incense for me... Thank you ... Blessings and Peace ....” -J.E. “Just received my order. Once again, thanks for wonderful merchandise, great prices, and fast shipping... Living in West Virginia, I do not have access to many of the products which are available in large urban areas, so I rely on the internet for some of my shopping. 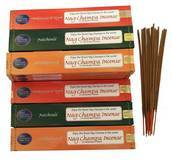 I've used Nag Champa incense for years, and it is my favorite scent in the world, but I had no idea there were so many wonderful products made with it until I found your website. 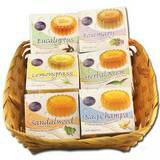 Now I enjoy the relaxing and revitalizing scent of Nag Champa everywhere - in my office, my car, my home and bath. Thanks again for making my whole world a little bit more beautiful...” -D.Q. “Wow! You have a customer for life! I often forward your e-mail ads to friends and fellow bellydancers, with praise about your customer service, products and quality. You have proven it again. Thank you for all of your kind responses.” -L.N. “Greetings, I just thought I would write and let you know I have received my order from you and I am just delighted... I have been looking for a Nag Champa Perfume Oil whose fragrance would last more than an hour or two... most of the 'other' Nag Champa fragrances I have found are, what would you call it? --- 'wimpy'? I am very impressed and will be ordering from you again. The order was delivered in a timely manner and everything was intact and I love the fact that the perfume oil comes with a little rollerball applicator. Again, thank you for your attention to detail, the quality of your products and as I stated, I will be ordering from your company again in the near future...” -E.A. “I just received my order today and I just want to say that when I opened the box everything was just perfect like always. Your company is the best I have ever dealt with and I shall remain a loyal customer until the day I die. I tell all my friends and family about you and again I just want to say thank you for the free gifts and the frosted glass candles.” -S.M. “Thanks for your help today - you are very sweet. I love your company & have told several people about it. 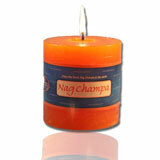 My mom & I will definitely continue to get our Nag Champa from you.” -D.B. 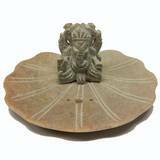 “Thank you, I received the order on the specific date assigned by UPS and I am grateful for the additional incense gift. I will refer others to your company as well.” -T.Q. “I just received my incense today along with the free gifts included and just wanted to say thanks! It smells great and it shipped really fast! This will last me a while but I will definitely be back for more and will pass your site on to some friends. Thanks again!” -J.Z. “I received my package today. Thank you so much for the gifts. You are so generous and kind. It was so unnecessary for you to do that, but what a treat for me.” -J.R.
“Dear People at Nandi- Thank you again for your marvelous service and your courtesy in a world that is lacking in civilities daily...my wishes and prayers for your best year yet!” -M.Y. “I received my order today and wanted to let you know how happy I was with the promptness of the delivery and...THE FREE GIFT! What an unexpected delight! Thank you very much.” -L.R. “I just wanted to let you folks know that I received my order yesterday. I wanted to thank you for the super prompt shipping. The free gift was especially nice to get. I’m really pleased that I found your site. Your merchandise is extremely well priced and the selection is absolutely wonderful.” -C.T. “I just received my order today and I am happy to say I am very pleased. Everything was packed nicely and I very much appreciated the extra gifts. I will definitely be ordering from you again.” -R.G. “I will definitely be a return customer. 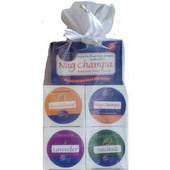 I love the soap and the massage oil – the Nag Champa fragrances – they are so soothing! Love your company!!! Thank you so much. Have an awesome day!” -L.B. “I received the package today!! Came faster than I thought! Thank you so much for the free gifts...I LOVE them. I love everything I purchased, I will definitely be a repeat customer! Even the packaging was the best! Thank you for being such wonderful people! !” -J.V. “I’m most happy to report that the new tower has arrived in pristine condition. I’m looking forward to tonight when I can put the new incense I have in my new tower and meditate on the beautiful day it's been. Thank you so much! You have certainly made me a lifetime buyer of Nandi Imports.” -J.W. “I am SOOOOOO excited. 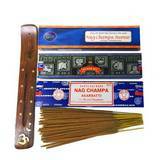 I didn't realize that Nag Champa comes in all these wonderful products. This is my all time favorite scent in the entire world!!!!!!! !” -L.B. “I just received my shipment today, as expected, via UPS and it was GREAT! Your Nag Champa Gold is a superior product, and all of the free items that were promised were included (plus some extras). I just want to thank you all very much for your products and efficiency, I will be shopping here very often in the future for ALL of my incense and candle purchases!” -J.S. “I wanted to thank you for a very positive online shopping experience. I was particularly grateful that you took the initiative to replace the out-of-stock product with one of greater value, and you included a free gift! Such wonderful customer service is unusual. I will definitely be spreading the word, and will shop with you again.” -C.F.